It is approaching that time when we need to be thinking about scheduling the last irrigation of the growing season. Crop water use in the first three weeks of August has been running below normal again this year. A check of evapotranspiration rates (ET) across south central Nebraska shows average crop water use of 0.20 inch per day. This is much lower than the 0.30 inch of water use you usually expect in mid to late August. So just how much water do we need to finish out the growing season? Table 1 gives you a good idea of water needed based on crop growth stage. During the heart of the irrigation season, we recommend keeping the available soil water level above the 50% depletion level. To do this we recommend irrigating as the soil water level approaches 35% depletion. This will allow a few days for the irrigation to be completed before the crop experiences any stress. As we near the end of the season, we can push the threshold to 60% depletion. Table 1. Crop water use for the remainder of the growing season for corn and soybean. The water-holding capacity of a soil varies with its texture and needs to be considered when determining how much soil water is available. For example, a loamy sand will hold about 1.1 inches of water per foot or 4.4 inches in the top 4 feet while a silt loam soil can hold 2.2 inches per foot or 8.8 inches in the top 4 feet. If the silt loam is at field capacity and we draw down the available soil water to 40% (60% depletion), we would have about 5.3 inches of useable water in the top four feet of soil. Corn at the beginning dent stage needs 5 inches of water to reach maturity (Table 1). Using the silt loam soil from above, the example field would have enough water to reach maturity and have an estimated 0.3 inches to spare if the corn is beginning to dent now (5.3 – 5.0 = 0.3 inches). The loamy sand, at field capacity, would have 2.6 inches available above the 40% (60% depletion) level. This field would need an additional 2.4 inches of water to reach maturity. One thing to note is that the time needed for corn to mature is dependent on growing degree days. If corn needs 5 inches of water to reach maturity and we receive some hot windy days in late August, the corn will still use 5 inches, it will just finish up a few days quicker. has just been updated to include a feature to schedule the last irrigation. Producers can enter watermark soil sensor readings and crop growth stage and the Crop Water App will estimate the amount of rainfall or irrigation water for the crop to reach maturity. In contrast, soybean maturity is dependent on day length. 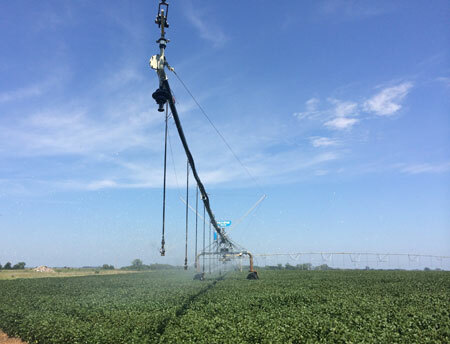 Because soybeans may use more or less water than the averages listed in the table, and because it may be difficult to determine the actual correct growth stage, it is important to continue to monitor soil water until maturity. This is where tools such as an ETgage and soil water sensors come into play. An ETgage will give you potential crop water use and the soil water sensors will give you an idea of how much water is stored in the soil profile. Then you will be able to determine how much water the crop will need in either irrigation or precipitation to finish out the year. For more information on this topic see NebGuide G1871 Predicting the Last Irrigation of the Season.